The genetic alterations that characterize oligodendroglial neoplasms have been defined over the past decade. In adults, oligodendrogliomas are genetically defined by the combination of IDH1 p.R132 or IDH2 p.R172 mutation, TERT promoter hotspot mutation (either c.-124C > T or c.-126C > T), and chromosomes 1p and 19q co-deletion, which is frequently accompanied by mutations involving CIC, FUBP1, TCF12, NOTCH1, and PIK3CA genes [2, 3, 7, 13, 21]. Oligodendrogliomas in children often lack the IDH mutation, TERT promoter mutation, and 1p/19q-codeletion that is observed in their adult counterparts [14, 20]. Instead, they most commonly harbor solitary pathogenic alterations in the FGFR1 oncogene that cause constitutive activation of the kinase domain via gene fusion, tandem duplication, or missense mutations that localize at one of two hotspots (p.N546 or p.K656) [18, 23]. To investigate the molecular pathogenesis of oligodendrogliomas arising during teenage years, we assembled a cohort of tissue specimens from three patients (Fig. 1a). The one male and two female patients ranged in age at time of initial surgery from 10-18 years. All patients presented with headaches that led to brain imaging, which demonstrated non-enhancing, T2-hyperintense masses centered in the frontal (n=2) or parietal (n=1) lobes (Fig. 1b). All cases were histologically characterized by an infiltrative glial neoplasm composed of cells with uniform round nuclei containing delicate chromatin (Fig. 1c). Mitoses were inconspicuous, and neither microvascular proliferation nor necrosis were present. Immunohistochemistry revealed that the tumor cells were OLIG2 positive, had intact/retained nuclear expression of ATRX protein, and showed only occasional positivity for p53 protein. The Ki-67 labeling index was uniformly low (less than 2%). Genomic DNA was extracted from formalin-fixed, paraffin-embedded tumor tissue, and targeted capture-based next-generation DNA sequencing was performed as previously described using the UCSF500 Cancer Panel [8, 9, 11, 16, 17], which assesses approximately 500 cancer-associated genes for mutations, copy number alterations, and structural variants including gene fusions (Additional file 1: Table S1). All three cases demonstrated IDH mutation, with two harboring IDH2 p.R172K and one harboring IDH1 p.R132H (Additional file 1: Table S2 and Additional file 2: Fig. S1). Additionally, case #1 contained a damaging missense mutation in TP53 (p.R175H), which was present at a subclonal allele frequency (6%) relative to the IDH1 mutation (20%), indicating that it was only present in a subset of tumor cells. Case #3 additionally contained a truncating nonsense mutation in the CIC tumor suppressor gene (p.S349*). No pathogenic mutations were identified involving any of the other genes targeted for sequencing by this assay. Chromosomal copy number analysis revealed losses of 1p and 19q in all three cases, which uniformly involved the entire arms of these chromosomes. No other chromosomal gains, losses, or focal amplifications or deletions were identified in any of the tumors (Additional file 1: Table S3 and Additional file 2: Fig. S2). Notably, all three cases lacked mutation at either of the two hotspots in the promoter region of the TERT gene (Fig. 1d), and also did not harbor either TERT gene amplification or structural rearrangement within the 50 Kb of upstream sequence covered by this assay, where rearrangements are commonly found in high-risk neuroblastomas, chromophobe renal cell carcinomas, and IDH-wildtype glioblastomas lacking TERT promoter hotspot mutation [5, 6, 15, 22]. In order to further assess the frequency of TERT promoter mutation in IDH-mutant and 1p/19q-codeleted oligodendrogliomas in teenagers, we examined data from the four major pediatric low-grade glioma genomics studies published to date [1, 18, 19, 23]. Together, these four studies included only a single teenage patient with an oligodendroglioma, IDH-mutant and 1p/19q-codeleted, in which TERT promoter status had been assessed. This patient (SJLGG034 from the Zhang et al study, also labeled LGNT20 in the Qaddoumi et al study) was a 15 year old male with an oligodendroglioma that harbored IDH1 p.R132H mutation, multiple CIC mutations, 1p/19q-codeletion, and reportedly lacked TERT promoter mutation [18, 23]. We next examined data from the most recent glioma metagenomics study by The Cancer Genome Atlas Research Network that included 89 cases of oligodendroglioma, IDH-mutant and 1p/19q-codeleted, WHO grade II or III, in which TERT promoter status was reported . 87 of these 89 cases (98%) reportedly harbored TERT promoter hotspot mutation and were all in adults (age range 20-75 years at diagnosis). Two of the 89 cases are reported to be TERT promoter wildtype, one in a teenager and one in an older adult. 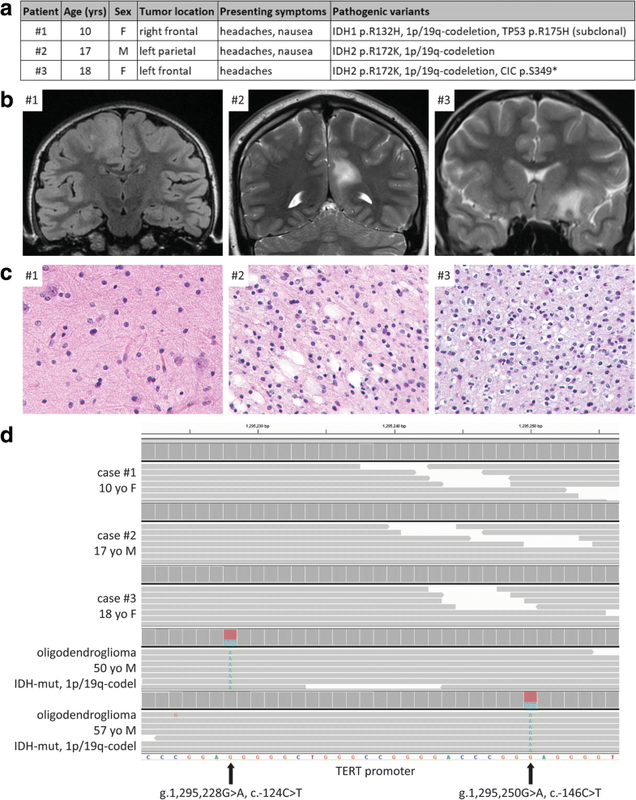 The first TERT promoter wildtype oligodendroglioma case (TCGA-DB-5278) was centered in the left frontal lobe of a 17 year old male who had presented with seizures, demonstrated WHO grade II histologic features, IDH1 p.R132H mutation, CIC mutation, 1p/19q-codeletion, and did not have TERT overexpression. The second TERT promoter wildtype oligodendroglioma case (TCGA-HT-8010) was in a 64 year old female, had WHO grade II histologic features, IDH mutation, NF1 mutation, 1p/19q-codeletion, and also did not have TERT overexpression. Thus, according to the latest published dataset from The Cancer Genome Atlas, TERT promoter mutation was present in 87/88 cases (99%) of IDH-mutant and 1p/19q-codeleted oligodendrogliomas in adults age 20+ years at time of diagnosis. In contrast, TERT promoter mutation was present in 0/5 cases (0%) of IDH-mutant and 1p/19-codeleted oligodendrogliomas in teenagers, including the three patients from our cohort, one patient from Zhang et al, and one patient from The Cancer Genome Atlas. Together, these findings suggest that oligodendrogliomas arising during teenage years are genetically distinct from their adult counterparts based on the absence of TERT promoter mutation. Though telomere maintenance has been proposed as a requirement for gliomagenesis in adults [10, 12], it does not appear to be necessary in oligodendrogliomas, IDH-mutant and 1p/19q-codeleted, in teenagers. We speculate that this may be due to the low number of cell divisions that have taken place in oligodendrogliomas arising in teenagers relative to adults such that selection pressure for acquisition of telomere maintenance mechanism has not yet occurred. The absence of telomerase activation in these tumors may potentially correlate with the less frequent anaplasia and more indolent clinical behavior that has been observed in pediatric oligodendrogliomas compared to their adult counterparts . B.C.B. is supported by an NCI Outstanding Investigator Award (R35 CA220481). D.A.S. is supported by NIH Director’s Early Independence Award (DP5 OD021403) and the UCSF Physician-Scientist Scholar Program. Sequencing data files are available from the authors upon request. JL, ARP, AP, and DAS performed pathologic assessment. SHC and CR provided neurosugical management. AB provided neuro-oncology management. JVZ, CO, JPG, BB, and DAS performed genomic analysis. JL and DAS wrote the manuscript and created the figures. All authors read and approved the final manuscript. This study was approved by the Committee on Human Research of the University of California, San Francisco, with a waiver of patient consent. The authors declare that they have no competing interests related to this study.